Prepare the terrine at least a day in advance. Mince the belly of pork with 250 grams of chicken. Mix well adding the crushed garlic, chopped shallots, green peppercorns and crushed juniper berries. Pour over the glass of red wine and allow to marinade. Take half the minced meat and fill the dish halfway. Sprinkle with chopped herbs. Cut the remaining 250 grams of chicken into strips and place down the centre together with 100 grams of chicken livers. Add more herbs and cover with the rest of the minced meat. Press down gently and wrap the bacon over the top. Decorate with lemon slices and a couple of bay leaves, cover with tin foil and place in a Bain Marie; a roasting tin half filled with hot water. To be sure the meat is cooked pierce with a long skewer, if the juice is clear the terrine is cooked, if it is still pink, cook a little more. When you are confident it is cooked take it out of the oven and lift carefully from the Bain Marie. Tip water out and return the cooked terrine to the dish. Put a heavy weight on the top. I use a brick and Granny’s old weights from her old fashioned kitchen scales, but improvise. The juices will overflow a little. When the whole is quite cool, refrigerate. Slice and serve with salad and new potatoes the next day. Francatelli was Queen Victoria’s Chef but don’t let that put you off! Venison is a very healthy meat dense and rich in flavour but low in fat, good for those watching their cholesterol. It is important to keep the meat moist while cooking without adding extra fat and defeating the object! That’s where Francetelli comes in. Strictly speaking the sauce was made separately and served with the cooked venison but try it like this………. Chop the shallots finely. Heat the olive oil in a frying pan. Add shallots and allow to soften but not brown, add the sausages and the tomatoes. Simmer for 15-20 minutes stirring occasionally until the sausages are cooked through. Cut one in half to make sure. Add the wine, lemon zest, cinnamon and redcurrant jelly to the pan and give it a stir. Heat gently, taste, season, remove the cinnamon stick and serve with new potatoes and summer vegetables or a green salad. Here is an OLD ENGLISH recipe which still survives in Sussex. Line a deep pudding basin with suet crust pastry, pack tightly with pieces of turkey, stuffing, cranberry sauce, and gravy. 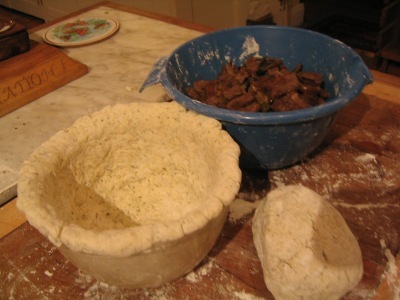 Cover with a lid of the suet crust and steam as you would a steak and kidney pudding. Dorothy Hartley ( Food in England: 1974) says a mushroom sauce goes very well with this. Gently poach two chicken Supremes or chicken breasts in enough stock to just cover them. Add a little white wine and a few sprigs of fresh *French tarragon. Cook for about twenty minutes. Set chicken aside in a warm place (not a hot oven!!) while you make the sauce. Strain the cooking juices through a sieve. Melt 1 oz of butter in a little pan, stir in a tablespoon of flour…..off the heat…..gradually add the strained juice stirring all the time to make a smooth mixture. Return to the heat and continue to stir until the sauce thickens. Cook two more minutes. Add a large spoonful of crème fraiche or cream. Warm gently, don’t boil! Spoon the sauce over the chicken and serve with the new potatoes, spinach and asparagus! Sautéd Chicken with Garlic and Herbs. Mixed chopped fresh herbs: parsley, thyme, a little sage and maybe a few wild garlic leaves in spring. In summer the mix will be different, maybe tarragon and lemon zest or basil, chives and marjoram. The herbs that flavour of the dish will reflect the season. Cut the chicken into six or eight pieces, save the carcass*. Melt the butter in a heavy based pan, one which has a close fitting lid, add the olive oil. Put the chicken pieces in the pan skin side down. Brown a little then lower the heat and turn the meat. Cover the pan and cook for 40 – 45 minutes turning again occasionally, until the chicken is cooked through. Remove the chicken from the pan and keep warm. Now add the crushed garlic cloves and chopped shallot to the pan, stir in the wine scraping up all the residue with a wooden spoon, let it bubble, add lemon juice and half chopped herbs, taste and adjust the seasoning. Put the chicken back into the pan, cover and cook a further five minutes. Remove from the heat sprinkle with remaining herbs. Serve straight from the cooking pot with crusty bread and a green winter salad. * Make chicken soup for tomorrow with the carcass!